By Travis - Peru - 05 Jun/03 - Viewed 1661 times. We arrived in Arequipa on Sunday morning, after taking an uncomfortable overnight bus from Nazca. Arequipa, at least the historic center, is a very clean and scenic town, with most of the buildings constructed of white volcanic stone. There are a number of snow-covered volcanic peaks surrounding the city which also add to the atmosphere. We found a suitable hotel (our room wouldn’t be available for a few hours, as checkout time wasn’t until noon), then visited a number of travel agencies to get information about trekking in Colca Canyon. We decided on a four day trip, including travel days on each end from Arequipa and back (there were shorter options in which you travel one or both ways at night, but we’d had enough of trying to sleep on buses bumping over dirt roads in the Peruvian highlands). We spent a couple of hours on a guided tour of Monasterio de Santa Catalina, which was renovated by a private company in 1970 and opened to the public after a massive earthquake struck the area. It is still an active convent, with a small group of nuns living in a modernized area closed off from tourists. Some parts of the monestary were beautiful, but the descriptions of the nuns lives and the changes in their closed society over the years was the most interesting to me. For example, the second daughter in a family was always destined to be a nun to pray for her family. After her time as a novice in the convent, her family provided her with a private house and servants (if the family had the means, if not she would be a servant of one of the wealthy nuns) and the social structure of the community was very heirarchical based upon wealth. The monestary is surrounded by a high wall, and these private homes line the streets within the walls—a city within the city of Arequipa. Sometime in the 1800s, the mother superior shook things up and did away with the private homes, the servants, the class structure, and all of the nuns lived in communal areas and shared the work equally. At noon on Monday, Roy (a 38 year old, father of four who runs a small inn in the canyon) came to our hotel and introduced himself as our guide. A six hour, bone-jarring bus ride later, we arrived in Cabanaconde, a small town at the rim of Colca Canyon and the last stop for all motorized transportation in the area. We started hiking at eight the next morning, and had our first views of the canyon after about an hour. We arrived at Roy’s inn around noon, about thirty minutes after crossing a small footbridge over the Rio Colca. The facilities consisted of a few small cabins made of mud brick with a thatched roof; Roy, his family and his neighbors had made these over the years. There was an open grassy area with flowers around the edge, and a shaded dining area where Abi and I played cards for a good part of the afternoon (we also took a short hike back to the river to pass a couple of hours). Probably the most enjoyable part of our stay was talking with Roy about life in this little village of thirty families (spread out over the northern slopes of the canyon), with the nearest stores and services a three hour walk out of the canyon, with no electricity or telephone, and with the stars, an open fire in the kitchen, friends and family to pass the evenings. The next day we hiked downriver through the canyon, passing a couple other small villages and a dusty soccer field where there are inter-community soccer matches on Saturdays. 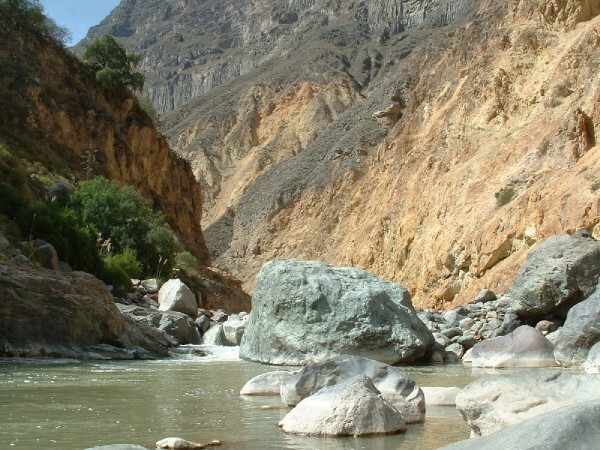 After about three hours we reached an area called the Oasis, several lush acres situated on a ledge about fifty meters above the Rio Colca where there are a couple of rustic resorts. We stopped there for lunch, and took a dip in a fresh water swimming pool, two of the four walls of which were large boulders, and which was fed by a cascade (with another waterfall flowing out of the other side of the pool and on to the Rio Colca). At 2:00 PM, we started our hike out of the canyon and back to Cabanaconde, a hot, dusty, steep and miserable two and a half hours. We saw a couple of condors along the way. The trip back to Arequipa the next day was a debacle. First, the 7:00 AM bus that we were going to take for the first leg of the trip (to an overlook of the canyon where a group of condors regularly do their morning exercises) was cancelled. We took the next bus an hour later, and (very long story short) ended up having to take three different buses and arrived in Arequipa three hours later than expected. This route is very underserved by bus lines; in addition to every seat being full on every bus, the aisles are crammed with passengers hanging onto the overhead baggage racks, sitting on the floor, leaning on the backs of seats, holding babies, standing in the front of the bus where the driver sits. And not just for a few minutes until a seat opens up, they travel for hours like this (some of them dozing off while on their feet). We had a pleasant, two-hour layover in Chivay where we ate a nice lunch, then took a quick dip in the thermal baths (about 110 F) outside of town before enduring the last leg of the trip to Arequipa (which included delays for, not one, but TWO flat tires). On Friday, June 6, 2003, in Arequipa, Peru, a green, Eastpak daypack (affectionately known as Greenie) was laid to rest. Greenie was born in the factories of Eastpak in the Appleton, Wisconsin, circa 1990, and was adopted in 1991. Greenie earned his stripes during his early years of service by hauling books around the campus of MSSC from 1991 to 1995, with summer duties in Yellowstone N.P., Fort Knox and various locales. After these first few years of heavy use, Greenie experienced a brief phase of unemployment during 1996. However, in the fall of 1996 he rose to his toughest challenge to date, being crammed with law school casebooks, notes, computer discs, sack lunches and workout clothes—exceeding weight and volume limits far beyond his original design limits. Following those three years of abuse, Greenie entered his golden years in which he was occassionally called upon to haul a change of clothes and scorebook for a Cardinals baseball game after a day at the office. Although deserving to continue in a life of weekday evenings at Busch Stadium for years to come, Greenie was faced with another challenge in 2003, a challenge that in the end would prove to be his undoing—six month tour of South America. The guidebooks, the water bottles, the camera equipment, the bumpy buses, the heat and cold, the dryness and humidity, they proved to be too much for Greenie. The first sign was the failure of a seam of his small outer pocket which had to be sewn, then another seam at the bottom of the main cargo area needed repairs. The rigors of an eleven day trek in the Cordillera Blanca took their toll, and soon there were two more failing seams on his main compartment. We all knew it was time. Greenie hung in there for one more trip, Colca Canyon, before he was given a merciful and honorable end to his existence. Greenie is survived by his owner of twelve years, Travis, co-owner of eight years, Abi, and an upstart tan and black daypack made by Crepier purchased in Arequipa who, by all indications, will never be half the trooper old Greenie was.